I love cranberry and lime in my drinks. If I had a ginger ale or 7-up I’d add cranberry and lime juice to it. In order to make the drink a little more healthy, with less calories and sugar, I came up with a version of my cranberry lime drink to continue the fetish. Of course you could also use cherry or raspberry juice instead of cranberry if you wish. This drink is also really fun to make for the kids on a warm sunny day. Directions: In a drinking glass fill with ice about 2/3 full. Add in the lime juice, 100% cranberry juice (not from concentrate) and simple syrup. Then pour S. Pellegrino to fill glass. Stir well and garnish with cranberries or lime wedges. Enjoy! Directions: In a saucepan combine water and sugar. Bring to a boil until the sugar dissolves. Allow to cool before using. notes: I make my Simple Syrup ahead of time and store it in a glass bottle in my refrigerator. 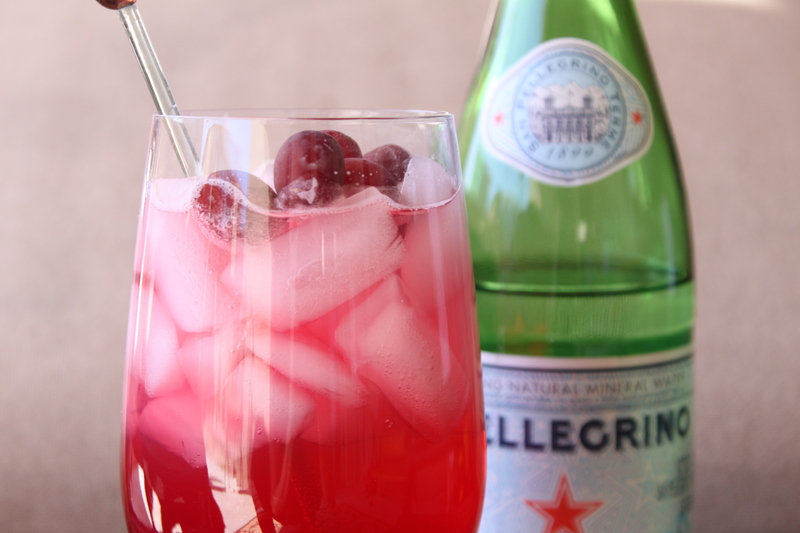 That way I always have some on hand for a glass of my Cranberry Lime Sparkle or as a glass of Ice Tea. … birthdays run in packs in my family. I want to wish a Happy Birthday to my many loved ones this week: DD, LD, KD, CD, CD and CG. What a fun-filled birthday week. Whew! Made this delicious drink last night with our curry chicken salad wraps. Delightful on a hot spring day! Thanks for sharing!